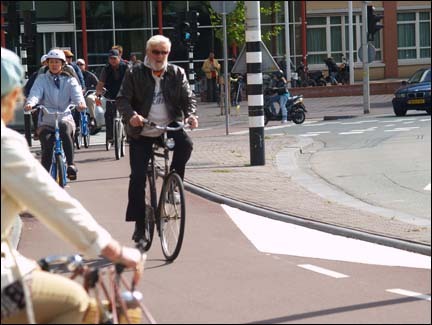 On a fact-finding mission to the Netherlands, a delegation of California public officials marvel at the promise of bicycles for 21st Century transportation. Jay Walljasper gives this personal account of the trip. I joined a team of latter-day explorers in the Netherlands this month on a quest to discover what American communities can learn from the Dutch about transforming bicycling in the U.S. from a largely recreational pastime to an integral part of our transportation system. Patrick Seidler, vice-chairman of the Bikes Belong Foundation, sponsor of this fact-finding mission for key decisionmakers from the San Francisco Bay Area, announced we were in search of the "twenty-seven percent solution" - the health, environmental, economic and community benefits gained in a nation where more than a quarter of all daily trips are made on bicycle. Of course, the bicycle enjoys certain advantages in the Netherlands, notably a flat landscape and a long cycling tradition. But the idea of learning from the success of the Dutch is not far-fetched. The Netherlands resembles the United States as a prosperous, technologically advanced nation where a huge share of the population owns automobiles. They simply don't drive them each and every time they leave home, thanks to common sense transportation policies where biking and transit are promoted as an attractive alternative to the car. Indeed, millions of Dutch commuters combine bike and train trips, which offers the point-to-point convenience of the automobile and the speed of transit. Seidler noted that a delegation of public officials from Madison, Wisconsin returned home from a similar tour of the Netherlands last spring, and within three weeks was implementing what they learned on the streets of the city. Bikes Belong, a non-profit group dedicated to getting more people on bikes more often, regularly takes public officials on tours of cities where biking is popular. The trip started in Utrecht, where our group marveled at the parade of bicyclists whizzing past us all over town. This raised an immediate question: why is biking a way of life in the Netherlands and only a tiny portion of the transportation picture in United States? We uncovered a large part of the answer that afternoon at a suburban primary school, where Principal Peter Kooy told us that 95 percent of older students-kids in the 10-12 age range-bike to school at least some of the time. Compare that to the 15 percent who either walk or bike to school in the United States, down from 50 percent in 1970, according to the National Center for Safe Routes to School program. "I came to the Netherlands to have my mind blown about biking," declared Damon Connolly, vice-mayor of San Rafael, California. "And that sure happened when I heard that 95 percent of kids bike to school." This helps explain the childhood obesity epidemic in the U.S., but also why so few adult Americans ride a bike to work or to do errands-a mere one percent of trips compared to 12 percent in Germany, 18 percent in Denmark, and 27 percent in the Netherlands. A commitment to biking is not uniquely imprinted in the Dutch DNA. It is the result of a conscious push to promote biking that has resulted in a surge of cycle use since the1970s. A large part of that success can be attributed to what happens in school. Kids learn how to bike safely as part of their education said Ronald Tamse, a Utrecht city planner who led our group on a two-wheel tour of the city and its suburbs. A municipal program sends special teachers into the schools to conduct bike classes, and students go to Trafficgarden, a miniature city complete city with roads, sidewalks and busy intersections where students hone their pedestrian, biking and driving skills in non-motorized pedal cars. At age 11, most kids in town are tested on their cycling skills on a course throughout the city, winning a certificate of accomplishment that ends up framed on many bedroom walls. "To make safer roads, we focus on the children," Tamse explained. "Because it not only helps them bike and walk more safely, but it helps them to become safer drivers who will look out for pedestrians and bicyclists in the future." These kinds of programs would make a huge difference in the United States, where 60 percent of people report in surveys they would like to bike regularly if they felt safer-but only eight percent actually do. Next stop was the Hague, where bikes account for 27 percent of all trips around the city of 500,000-exactly the average for the Netherlands as a whole. But not content with being merely average, the Hague is spending 10 million euros a year (roughly 14 million dollars) to improve those statistics. Hidde van der Bijl, a policy officer for cycling in Hague's city government, outlined their strategy about improving bicycle speed and safety: separating bike paths as much as possible from city streets, and when that is not possible, designating certain streets as bike boulevards where two wheelers gain priority over cars and trucks. Bike boulevards are gaining ground in the U.S,, and are being used in Portland, Berkeley, Minneapolis and other cities. These are practical innovations that could make a dramatic difference in nearly every American town because research on this side of the Atlantic shows that physical separation from motorized traffic on busy streets is the single most effective policy that gets more people to bike. But officials in the Hague are realizing that safety isn't the only thing that discourages people from riding bikes more frequently; that's why they are tackling the problems of bike parking. This might seem a minor point to Americans cyclists who seldom find it hard to park bikes just a few steps from their destinations. But upon closer look, a lack of convenient parking can be a significant limitation facing cyclists in any large city. "The car is parked out in front of the house on the street, while the bike is stuffed away out back in a shed or they have to carry up and down the stairs in their buildings," van der Bijl explained. "So people choose the car because it is easier." "It's an issue for me personally," agreed Ed Reiskin, San Francisco's director of public works, "because I always have to carry my bicycle down to the street." People also worry about their bike being stolen off the street at their home or job. That's why creating more secure bike parking in residential neighborhoods, commercial districts and workplaces is a priority for Hague's transportation planners. Meanwhile in high-density residential neighborhoods, the city is installing bike racks or special bike sheds to make life easier for two-wheel commuters, sometimes taking over auto parking spaces to do it. One parking space can be converted to 10 bikes spaces, according to van der Bijl. On our third day in the Netherlands, we biked across the Atlantic-at least it felt that way in Rotterdam, a city whose streets seemed almost American. We came face-to-face with familiar road conditions: heavy traffic on 4-lane roads with aggressive drivers. Bob Ravasio, a Marin County realtor and city council member in the town of Corte Madera, quipped "Utrecht seems like a fantasy land now. This is what we're up against at home." Rotterdam heightened our optimism about boosting biking in the U.S. when we learned that 22 percent of trips around town each day are made on bicycles-below average among Dutch cities but more than double the rate of any major American city. If Rotterdam can do it, some can we. Even more encouraging was the news from Tom Boot of the city's planning department that Rotterdam has been increasing its share of bike traffic by 3 percent annually for the last several years. They've achieved this phenomenal growth by expanding and improving the network of bikeways-separating them from car traffic whenever possible and coloring the asphalt bright red everywhere else to clearly mark bike lanes for motorists to see. "Good things are happening here," observed Bruno Maier, vice-president of Bikes Belong, "and you can really envision it happening back home." San Francisco board of supervisors president David Chiu looks out on a new neighborhood in Amsterdam, where bikes and pedestrians (and boats) take priority over cars. The experience of biking through four Dutch cities provided our team of Bay Area transportation leaders with plenty of examples of what they can do to make cycling more safe, popular and pleasurable back home. Bridget Smith, for instance, director of San Francisco's Livable Streets Program, is excited about using more color on the roadways as an inexpensive but dramatic way of making sure everyone can tell bike lanes from car lanes. But the experience also fueled our imaginations about the future of cities. We saw one glimpse of what's possible on Java Island, a cluster of neighborhoods constructed over the past 10 years in what was once the city's harbor. It's a scenic waterfront location with strikingly handsome modern architecture in a pleasing variety of styles that is linked to the rest of the city by tram, road, and bike paths. Although brand new, it exudes a charm reminiscent of the city's famous canal neighborhoods-which, for my money,isone of the most vibrant and downright pleasing urban quarters on earth. Like old Amsterdam, Java Island enjoys a picturesque waterfront setting. But it shares another trait with the city's medieval districts that you would never expect in a newly built housing development - it accommodates bicycles more easily than cars. Motorized traffic is shunted to the side of each cluster of apartment buildings in underground parking garages, while pedestrians and bicyclists have free reign of the courtyards that link people's homes like a green commons. This result of this visionary planning is more than just lovely-Java Island represents a bold new vision of urban life where people matter more than motor vehicles. You feel a liberating sense of ease moving about these new neighborhoods-and so do the residents. I've never seen kids-even really young ones-who look so completely comfortable running around their neighborhoods, not even during my own childhood in the days before autos completely ruled the road. We passed two sets of young girls staging tea parties, one of them taking place on a blanket just inches from the joint biking/walking trail that served as the neighborhood's main street. Pascal van den Noort, a transportation consultant leading our tour through the city, urged the group to "imitate this in California, please." Amsterdam city council member Fjodor Molenaar, who met up with us on Java Island, explained that the Dutch call this an "Auto Luw" development, which translates as "car light" or "car sparse," adding that this planning idea is now the official policy of the city. To get a sense of how it feels to bike in the Netherlands, here is video that Molenaar recommended to us at a meeting the next day with city transportation officials at the mayor's residence. It's a trailer for a new movie called "Riding Bikes With the Dutch" in which filmmaker Michael W. Bauch chronicles his family's adventure swapping homes with a family in Amsterdam. On our last day, after a lengthy jaunt through Amsterdam-covering medieval and modern neighborhoods, rich and poor ones, all full of bikers-we dismounted for one last discussion at an outdoor café overlooking the waterfront. The next day most of us would be headed back to our homes and jobs and cars in the U.S., where most people would dismiss the idea of bikes making up a quarter percent of urban traffic as "science fiction." One question popping up all over the group was how we reconcile our amazing experience of biking in the Netherlands with the auto-choked streets of San Francisco, San Jose and Marin County? But as Hillie Talens of C.R.O.W. (a transportation organization focusing on infrastructure and public space) reminded us, it took the Dutch 35 years to construct the ambitious bicycle system we were now enjoying. In the mid-1970s biking was at a low point in the country and declining fast. Even Amsterdam turned to an American for a plan to rip an expressway through its beautiful central city. But the oil crises of that time convinced the country that they needed to lessen their dependence on imported oil. The Dutch gradually turned things around by embracing a different vision for their cities. While the country's wealth, population and levels of car ownership have continued to grow through the decades, the share of trips made by cars has not. We could accomplish something similar in the United States, by enacting new plans to make urban cycling safer, easier and more convenient. Following the Dutch model will make biking mainstream in America. The morning and evening rush hour of cyclists you see on the streets in the Netherlands are not all the young, white, male ultrafit athletes in spandex we are accustomed to seeing in the U.S.-people of all ages and income levels use bikes for everyday transportation, with women biking more than men. Of course, we won't do everything the same as the Dutch- there are considerable differences between the two countries geographically, politically and culturally. This was reflected in the questions our team posed to the numerous transportation experts we met during the week. Where did you find the money to do that? How did you overcome the opposition of motorists, merchants, developers etc.? And, inevitably, American ingenuity will envision solutions the Dutch, the Danish, the Germans or the Chinese never thought of. But the Netherlands does offer plenty of practical ideas to get started, as well as the inspiration of seeing a place where bikes have gained their rightful role as a form of transportation. Jay Walljasper is a contributing editor of National Geographic Traveler, Senior Fellow at Project for Public Spaces and co-editor of OnTheCommons.org. Editor of Utne Reader magazine for 15 years, he is the author of The Great Neighborhood Book: A Do-it-Yourself Guide to Placemaking and (coming this winter) All That We Share: A Field Guide to the Commons.